Cynthiana Vision Center located in Cynthiana Kentucky, purchased the Digital Lens Technology in 2003. Owner, Dr. Bret Hines, added the nanoCLEAR AR unit to his business in 2006. As shared on their practice website, Cynthiana Vision believes in providing patients with thorough eye health care and provides the latest in eye care technology and treatments. Angle Miller, a twelve year optician at Cynthia Vision has been working with the technology for over eleven years and is a big advocate of the system. “I love the speed of the lens production process,” said Angel. 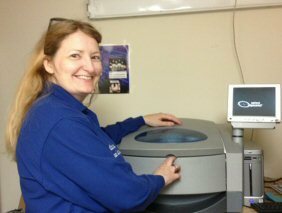 “It allows for a quicker order turn around over traditional labs and patients like that,” she added. When asked to share a story of how a patient benefited from the onsite production, Angel said, “Bad weather was coming and a patient needed to travel out of state. We were able to get his lenses in a day with the nanoCLEAR unit, and he was able to avoid the snowstorm in his travels.” Processing lenses on site definitely allows for a unique competitive advantage in the optical market place.